Click and Make-Up Beauty Blog: Whatta Dress! Given Kate's normally understated and 'safe' style I thought she would go for a a form-fitting dress along the lines of her sister Pippa's bridesmaid dress, but when she stepped out of the 1978 Rolls-Royce Phantom VI I had to say whatta dress! and from then on in I was gripped by the ceremony! Clearly the 'Mad Men' effect has reached Royal circles! 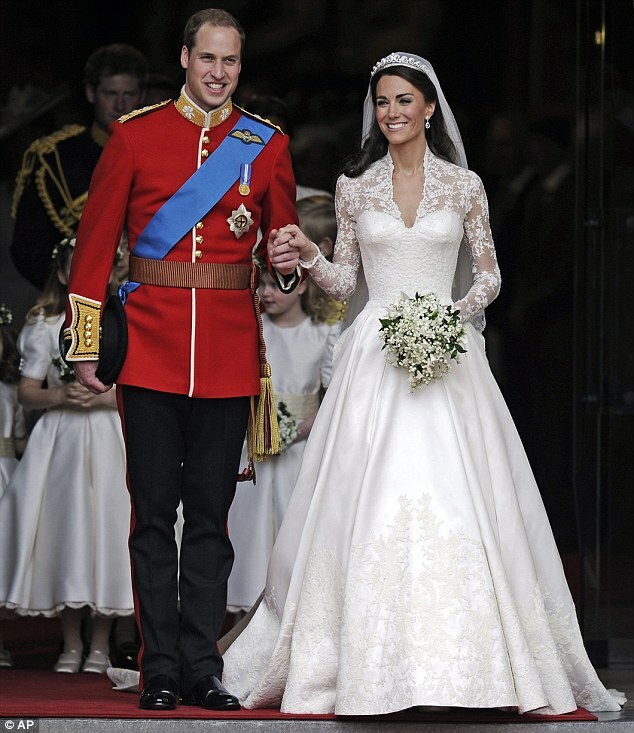 It was designed by Alexander McQueen's successor, Sarah Burton, and props to them all for keeping it a surprise! 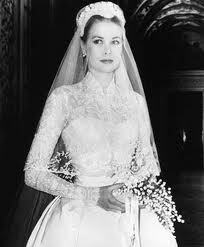 Of course it's drawn many comparisons to Grace Kelly's wedding gown of 1956 when she married Prince Rainier III of Monaco - another 'commoner' who married a royalty. Like Grace's, Kate's dress had a fitted bodice and long fitted lace sleeves with the skirt slightly flaring from her tiny waist. Even their bouquets bear a resemblance. The nine foot long train elegantly steered away from 'meringue' territory. She looked nothing less than regal in her timelessly beautiful dress. 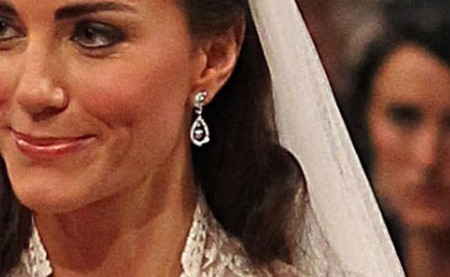 Her Cartier Halo tiara lent to her by the Queen (something borrowed!) was stunning and not to blingin' and her choice of a sheer, diaphanous veil was brilliant as it allowed everyone to see her, her happy expressions, and of course, get a glimpse at her DIY make up! 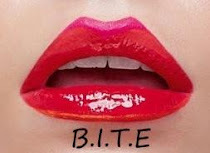 To prepare for doing it herself on the big day it's reported Kate received lessons from makeup artist Arabella Preston. Given that she probably didn't get a wink of sleep last night and has no doubt been stressing for the past six months I thought she looked healthy, radiant and elegant. She probably used a bit of a heavier hand than most wedding make up artists would, but in my opinion this is no bad thing. Of course you want to look 'natural' and dare I say 'virginal', or at least innocent on your wedding day, but I've seen so many brides who wear quite a full face of make up as their natural routine hand the reins over to a MUA on the day only to end up looking a bit washed out without much definition to their features. This is fine is you're a no-make-up kinda gal, but for the likes of me, this wouldn't fly! My only criticisms of Kate's make up was that she seemed to have brought her blush a bit too far in towards her nose, which can drag the face down, but then again this could have been part of a natural flush knowing that she had two billion people watching her! The black eyeliner under her lower eyelashes can look a little bit harsh and aging, but then again this is how she normally does her eyes. She could have dotted a charcoal eye kohl along the lash line or lined dark brown or charcoal eyeshadow along there with an angled eyeliner brush. Having said that, I think she looked stunning and her lipstick was a lovely colour which looked almost a light pinky coral under her veil. No doubt YouTube will soon be soon flooded by Kate's wedding make up tutorials, I found a few 'interpretations' which were put up before the actual wedding but none were very accurate to what she actually did. I adored the piece of music which accompanied her procession up the aisle, I Was Glad is from Psalm 122 and here's a video of it from the Queen's Golden Jubilee, it sounded pretty much the same today and was very moving. Don't ask me why but it reminded me of the waltzing scene at the end of Disney's Sleeping Beauty! Prince William was in his uniform as Colonel of the Irish Guards and looked very dashing, but I didn't know he'd gotten that bald! They are very sweet together and clearly in love. As for the other guests, Kate's mum looked lovely and not too 'mumsy' in Catherine Walker, a nod to Princess Diana as she was her favourite designer. Victoria Beckham looked sour-faced as usual, no doubt due to the huge heels she was wearing with a big mummy tummy! Her expression was more than made up for by David's hotness! Harry's on-off lady friend Chelsy Davy wore a bright aqua Alberta Ferretti skirt suit which was managed not to look too mature with a very wide collar. Her grey lace hat was by Victoria Grant and looked much better than some of the headdress monstrosities on display today *cough* Princes Beatrice *cough*. I woke up quite late, at 10.10 so I missed much of the coverage of the guests arriving at Westminster Abbey, but after the double kiss balcony scene I headed down to Hyde Park to soak up the atmosphere, which was buzzing. There are always those who moan and groan about the cost of the occasion on the taxpayer, but there are much worse wastes of money - wars against nations that pose no real threat to British sovereignty anyone? I'd rather donate a few bob to this and get a day off work to party in the streets! I picked this souvenir edition of the Evening Standard up just after 2pm - I have no idea how they put it together and got it off the presses in only a couple of hours! Kate's gown for the evening festivities is equally gorgeous and also designed by Sarah Burton, but white as opposed to her ivory wedding dress. Good hair too! Let's hope they have a happy ever after and I want to see babies soon! Where did you watch the wedding? Did you go to a street party? Same here, just the other day I didn't even know if I'd bother watching it! But after seeing the dress I was glued to the TV! 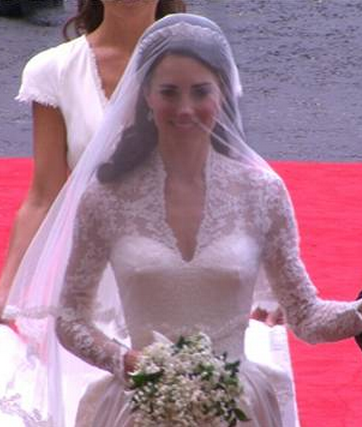 I don't care if Kate's a commoner, she looked more of a princess than anyone else there today. I wonder who Harry will end up with?! I was totally into this wedding, William is the same age as me and my mom always joked that I would marry him haha. Kate is gorgeous, and loved reading all the Grace Kelly comparisons this morning on Twitter. Aw, my friend in the pic above had Wills' poster on her wall when she was younger, as did Kate too I believe! Hey, it coulda been any of us! I'm in love with her wedding dress - the beauty of it makes me want to get married! Both dresses were so amazingly beautiful. She made a stunning bride. Most of my friends were away, so I sat there in my pjs eating popcorn watching it like a sad old spinster. And I might have cried a little bit. I agree with you about the tax payer dishing out for the wedding, I'd rather my money went on yesterday than all the other rubbish (like bailing out irresponsible banks) the tax payer gets lumped with. I was with my future in-laws blubbing away! The belgian TV was broadcasting it live online as well as on TV, so I watched half an hour of it (the Church part) on my computer. I was looking forward to seeing the dress and the makeup :) I think it's great that Kate stayed herself and respected her own style, I think a lot of brides make the mistake to chose someone else's style for their big day, that's too bad. The dresses weren't to my personal taste at all, but I think they looked lovely on her. Her make-up was okay. I agree, what happened to Will's hair? And after seeing Harry in all his gear, uhh hello!? I think I may just have to make him my new toy boy! Meeeoooooow! You know I like a man in uniform!! 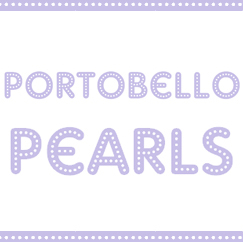 High Heels & Lipgloss - CHECK OUT MY GIVEAWAY! I was scrolling through this post and Talim pointed (at a picture of Kate) and said 'Aunty Kat!'. I don't know whether she thought Kate looked like you or if she knew this was your blog! @Jessica - oh I'm glad you agree, I didn't want to seem mean! @Rebecca - it looked gorgeous up in St Andrews yesterday - how wonderful to be where the romance began! I didn't ever think I'd want sleeves on a wedding dress, but this has changed everything! @Angela - agreed, I couldn't say which was my fave. @Robyn - I watched the ceremony in bed in my PJs too, and I may have gotten a little misty-eyed, it was all so overwhelming! @Skin Scrubs - glad you agree and bah to the cynics! @Musing on Beauty - you're so right, it's better to look like the best version of yourself on your big day and not try to be someone else. @Angel - your last comment just made my day!! Are you serious?! I have such a girl crush on Kate right now, she's my 'thinspiration'! Talim is officially my favourite neice! I adored both dresses but you need to be seriously thin to carry them off or they would look frumpy. I wouldn't mind a little bit of Harry, he seems like a fun guy and you wouldn't do my ginge fetish any harm!